Posted June 13th, 2010 by Ms. Jen & filed under nature + environment, oh, california. 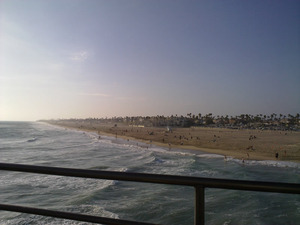 On the Left: 1950s/1960s photo from the Huntington Beach archives, On the Right: 2010 photo taken today by Ms. Jen with her Nokia N86. Sun. 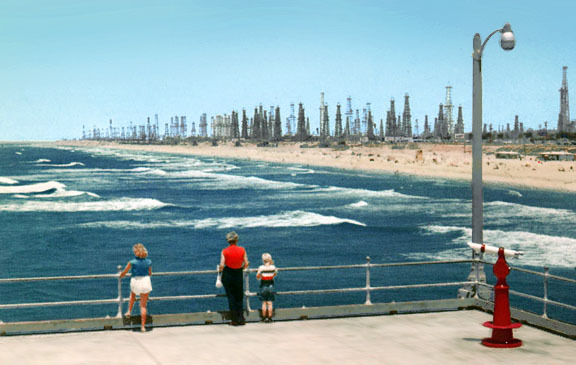 06.13.10 – Yesterday while researching my blog post on the century of oil wells & pumping in Seal Beach & Huntington Beach, California, I found the above left photo of oil wells as seen from the Huntington Beach Pier taken in the late 1950s or early 1960s. 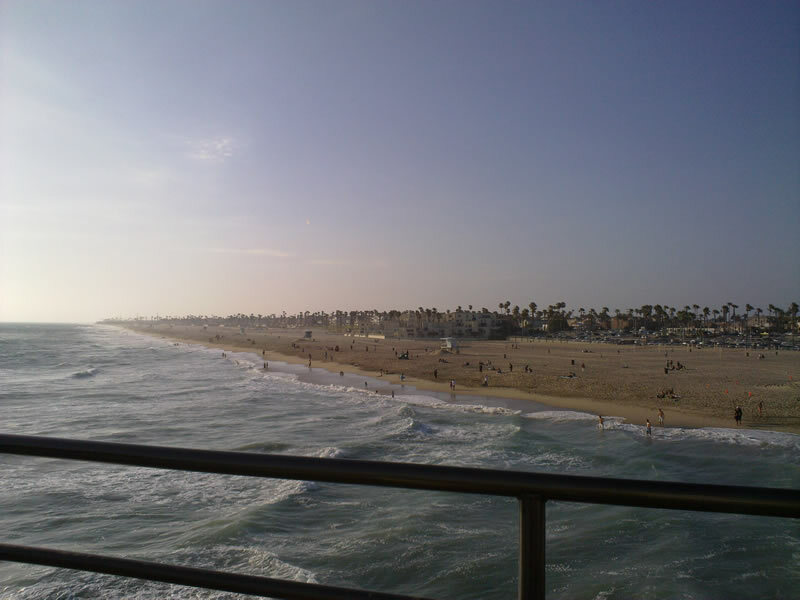 Today, I decided to drive down the pier before sunset and try to find the place the photo was taken and take another photo, on the right. The original must have been taken from the mid-pier lifeguard tower due to the angle, and I did not have access to the tower, so I took it from the place the ladies the in the original stood. I wanted to have the photos show how much HB has appeared to change in the last 50 years, although underneath not as much. There is still oil being pumped in between and around the million dollar ocean view homes. As I drove out of the parking lot just north of the pier, I decided to take a video, see below, as I drove north up Pacific Coast Highway to narrate both as a visual and verbal history what I know of the land between the Huntington Beach Pier and the Bolsa Chica wetlands. There is still some visible oil pumping and drilling, but much of it is now hidden or expensive homes have been built over the capped wells. 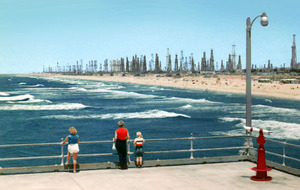 As one drives north on PCH from the HB Pier towards Bolsa Chica the oil rigs, wells, pipes, and tanks along the roadside become more visible to the watchful eye. Then as the road descends into the Bolsa Chica wetlands, the oil wells and pipes become highly visible on three of the four sides of the wetlands. Please do read yesterday’s blog post, On Offshore Oil, if you are wondering what I am talking about. Video taken by Ms. Jen with her Nokia N86 while driving north on Pacific Coast Highway from the Huntington Beach Pier. Posted November 28th, 2008 by Ms. Jen & filed under ideas + opinions. Compliments of the nice folk over at 3 Quarks Daily, late last week I read this article on The Imprinted Brain Theory by Christopher Badcock who writes on the genetic, gender, and environmental causes of mental disorders / diseases such as autism and schizophrenia, or how it may not be nature vs. nuture but nature + nuture. Badcock breaks down not only genetics and brain development, but also how environmental factors such as good maternal nutrition can contribute to more cases of autism and famine can contribute to more cases of schizophrenia. Also, there is implications in less extreme cases of non-mental disorders such as tendencies to a scientific / rational persuasion versus folks who tend towards intuition, the arts, and faith. I have been interested in the recent research of the last few years that is showing that one’s belief in religion or lack thereof may be influenced by the processing of one’s brain. If Badcock’s research and theory are found to be correct, then may the decline of religion in developed countries may be a result of increased maternal nutrition and pre-natal care? Before you get all up in your biscuits defending rational secularism or religion, read the article and think about the implications. 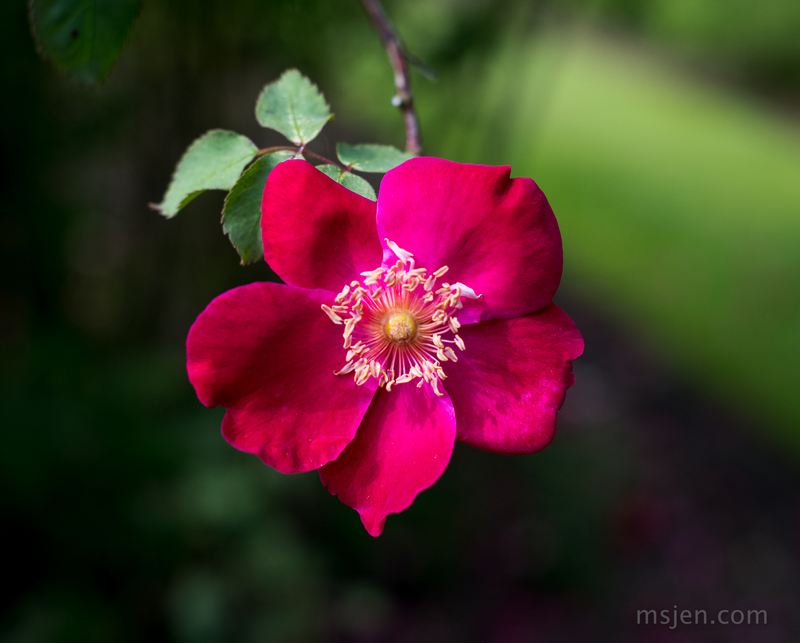 Posted June 30th, 2008 by Ms. Jen & filed under ideas + opinions, nature + environment, tidbits. In the Fervor to be Green and Do Your bit to Stop Climate Change Morality Play that is Contemporary Life (or how to be a good little Green who will go to Arcadia when you Die), the BBC has published an article today on “The Bulb Hoarders“. Horrors. “The government (UK) wants your old-fashioned energy-hungry incandescent tungsten light bulb gone, and gone soon. But some people are willing to go to great lengths to hang onto the lights they love. Incandescent bulbs – that’s the traditional kind to you or me – waste 95% of the energy they use, according to Greenpeace. They calculate that phasing them out in the UK will save more than five million tonnes in CO2 emissions a year. And yet some households are so attached to them that they not only keep buying them – they’re stockpiling them ahead of the day when they’re no longer available. In September last year, the UK government made a deal with major shops for the supply of traditional bulbs to be turned off. Some higher energy bulbs will be gone by January 2009, and all incandescent lights will be off by 2011. But isn’t life a give and take? Many of the folks interviewed for the BBC article and who commented think so.